Our A5-ranked Yamagata beef has been wet-aged for one month. Choose either sirloin or fillet. This nigirizushi is prepared by slicing Yamagata beef thinly. The combo consists of 4 pieces, but you can order additional sushi for 450 yen a piece. Abalone are taken from our fish tank and cooked while still alive. Listed price is for one abalone. Prawns are taken from our fish tank and cooked while still alive. Listed price is for one prawn. We serve Yamaguchi’s high-profile local sake “Dassai”―Junmai-daiginjoshu, quality pure rice sake brewed from highly polished rice. We have two kinds: “Sanwari Kyubu (39%) and “Niwari Sanbu (23%),” which are different from each other in their percentages of polishing. We recommend this course to first-timers: sashimi of fresh fish, assorted roasted vegetables, A5-ranked Yamagata beef steak, Kansai-style okonomiyaki (Japanese pizza) and dessert. A course of 7 dishes that includes A5-ranked Yamagata beef steak and Japanese dishes with distinctively fresh ingredients. These are cooked elaborately by the master chef, who has been engaged in making Japanese cuisine for 24 years. Our staff’s most recommended course consists of 7 dishes, including: A5-ranked Yamagata beef steak, nigirizushi with beef and foie gras canapés. This highest-grade course of seven dishes boasts of A5-ranked Yamagata beef steak, grilled foie gras, live abalone roasted in garlic butter, nigirizushi with Yamagata beef and so on. Do savor this course at our counter seats. 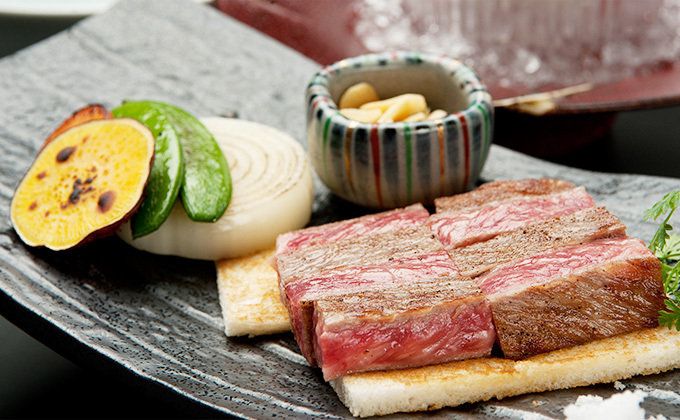 This course of 7 dishes is made from ingredients which the master chef purchased himself, that day, and has a focus on A5-ranked Yamagata beef steak. If you have any requests, the chefs will do their best to meet them. Because the master chef has to lay in foodstuffs on the day of use, reservations in advance are absolutely indispensable.